en nenjE – Oh my heart! sAdu udhaiththa oN malar sEvadiyum – the sweet foot which destroyed the demon who had entered a wheel. Was it not with the divine foot, which was soft like a flower that had just blossomed, that he destroyed the wheel! 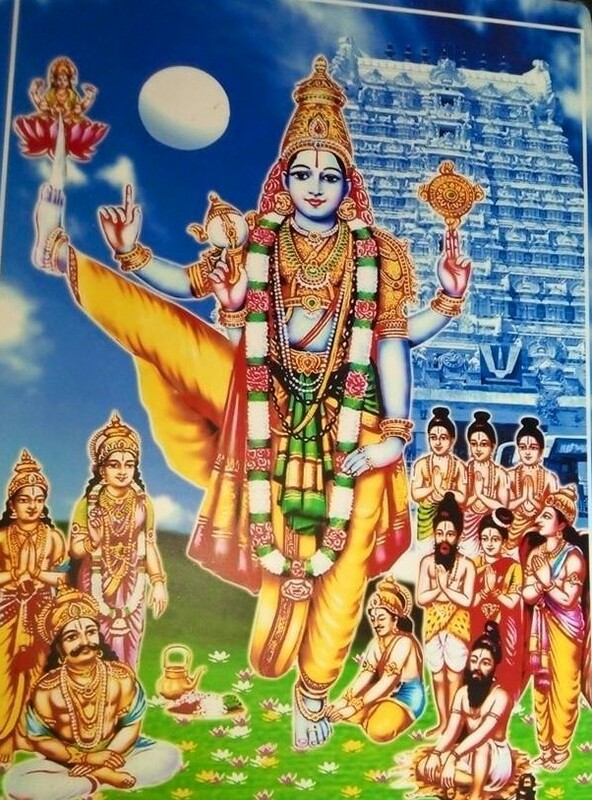 Iradiyum kANalAm en nenjE – we can see both the divine feet. We can see those two divine feet which are apt to be attained. en nenjE – Oh heart who is desirous of seeing. When asked as to what is the means for this, AzhwAr says that his divine feet are the means. kEsavanai – the term kESava refers to destroying of enemies [demon called kESi who came in the form of a horse]. He is the one who offers his divine feet as well as destroys enemies. than thuzhAy mAlai sEr mAyavanaiyE – Have firm belief in your heart that he is the means, who is decorated with thuLasi garland and who is having unbounded sweetness. thaN thuzhAy mAlai sEr mAyavanaiyE – Even if he is not simple to approach and even if he does not kill enemies, is it possible to ignore when seeing his sweetness? mAyavanaiyE – Don’t think that we need to take any effort to attain him. By using the long syllable in the word mAyavanaiyE it is implied that he is capable of making us to think only of him and of no one else. Once this firm belief is undertaken, we can see the two divine feet which are to be attained. There is no hurdle to seeing those two divine feet. If asked as to what is to be done after attaining them, AzhwAr says that we can continue to carry out kainkaryam permanently. This entry was posted in iyaRpA, mudhal thiruvandhAdhi on September 21, 2017 by T N Krishnan.